North South University (NSU) is facing an image crisis and becoming a breeding ground for terrorists as six of its students were found guilty in recent militants' attacks. The militant attacks have shocked everyone. Not only the students but also some teachers of the university are under suspicion of terror link.It is known that the sacked NSU teacher Hasnat Karim, one of the diners and siege hostages of Holy Artisan Bakery Café, is among the suspects of the deadliest terror attack. After observing Hasnat's activities on social media it was known that he has many terror links. Earlier in 2013, he was sacked for his reported involvement with banned militant group Hizb-ut Tahrir. The roles of trustee board members of North South University are questioned as many of them are allegedly involved in anti-social activities. Many of their activities are either political or semi-political. They were alleged for many indisciplines. An alarming situation is going on as one of the attackers who killed 22 people at an upscale cafe in Dhaka's Gulshan-2 on July 1 night before being shot dead by army commandos the next morning, was student of NSU. One of the terrorists who killed two policemen in an attack on a check-post near Sholakia Eidgah ground on Eid day morning on July 7, before being shot dead by police, was also an NSU student. Seven of the eight persons convicted for the February 2013 murder of blogger and Ganajagaran Mancha activist Ahmed Rajib Haider were also NSU students.University Grants Commission (UGC) investigators had found the banned militant outfit Hizb-ut Tahrir's printed materials in the NSU library last year. 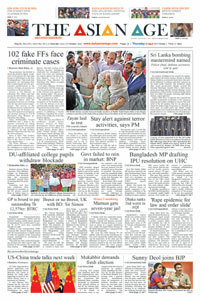 Several teachers and students of the university were sacked and rusticated for having alleged militant ties, according to the media.It has become a matter of worry after recent investigation findings suggested that students from reputed private universities like NSU and affluent families tend to get involved in extremism after running away from home.Recently, Education Minister Nurul Islam Nahid said: "The government is 'alert' about the situation in the North South University (NSU). "The Education Minister and UGC chairman Professor Abdul Mannan said that if the situation of NSU does not improves than the university will be closed. There were many alleged irregularities among some former trustee board members. BNP leader Abul Hashem, one of the ex-trustee members, was nabbed by ACC during caretaker government. Another former trustee board member of NSU, MA Shahjahan, had a record of sexual harassment for harassing a female teacher of the same university. The former chairman of the board of trustees Ragib Ali was also accused for corruption charges by ACC.The incumbent trustee members are M. A. Kashem, Azim Uddin Ahmed, Benajir Ahmed, Iftekharul Alam, Dr. Roushon Alam, Ragib Ali, M. A. Awal, Yussuf A. Harun, M.A. Hashem, M. A. Kalam, S. M. Kamaluddin, M. A. Kashem, Abul Kashem, Yasmin Kamal, Rehana Rahman, A. S. F. Rahman, Md. Shajahan and Dr. Junaid Kamal Ahmad,Mr. Mahbubar Rahman. However, the future of some 20,000 students of NSU is in an uncertain condition. Guardians and students urged to bring back the standard of education and academic environment in the university.Experts said that lack of cultural activities is one of the reasons behind this misdoing in the university. They also feared the future of the students of NSU as many of the students are involved in drugs, abuse and cyber crime. The university should be more careful in appointing teachers and admitting students, experts opined.NSU was well known for its academic excellence but the present situation is alarming. The students and guardians hope to get rid of this image crisis of the university.Seeking anonymity, a psychologist said that the students need proper guide and counseling. Many academic institutions in the world have counseling, physiological and criminology section to guide their students. As NSU claims to provide the international standard they should follow such systems, the expert said.